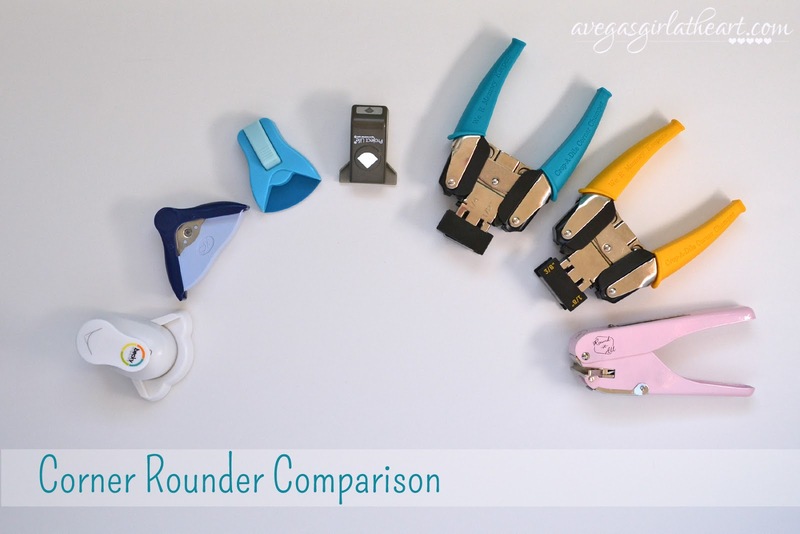 At least a couple of times a week, I see a question pop up on my Facebook group feed asking which corner rounder is the best for Project Life/pocket style scrapbooking. Since I have acquired way too many corner rounder punches, I thought I would post a little comparison and tell you which one is my favorite. I am comparing seven different corner rounding punches here. This photo shows the two corners lined up - they match perfectly. With this punch, there is a piece on the bottom that helps you to line up your corner to punch it. (You would also remove this piece by flipping the punch over, pushing in slightly and pulling the piece out, to empty the punch). I've found, however, that I quite often somehow mis-align the card and end up with wonky corners. I've done this a few times on a photo and had to reprint the photo. I don't know if this is user error (it very well could just be me) but it's happened so often that I believe there's something not-quite-right with the punch. Thus, it is not my favorite, even though it does match exactly. 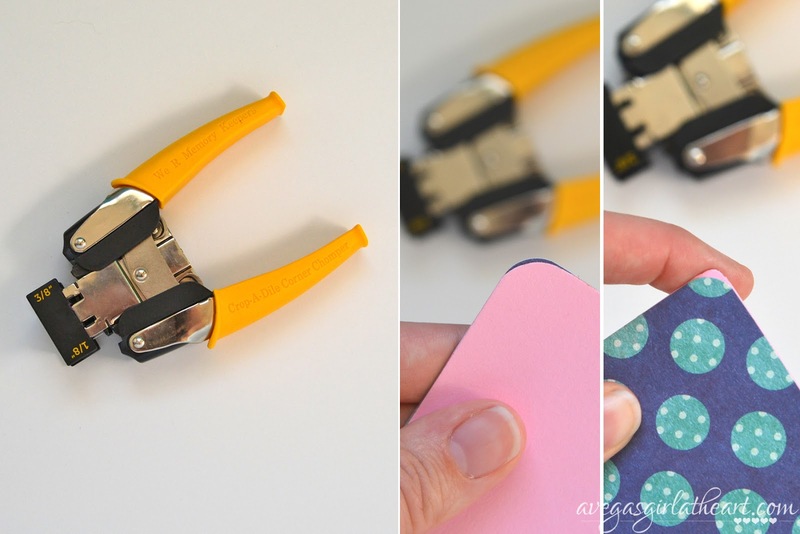 It is inexpensive though, especially with a coupon at a chain retailer, so if you need a corner punch for Project Life, you might want to try it out. 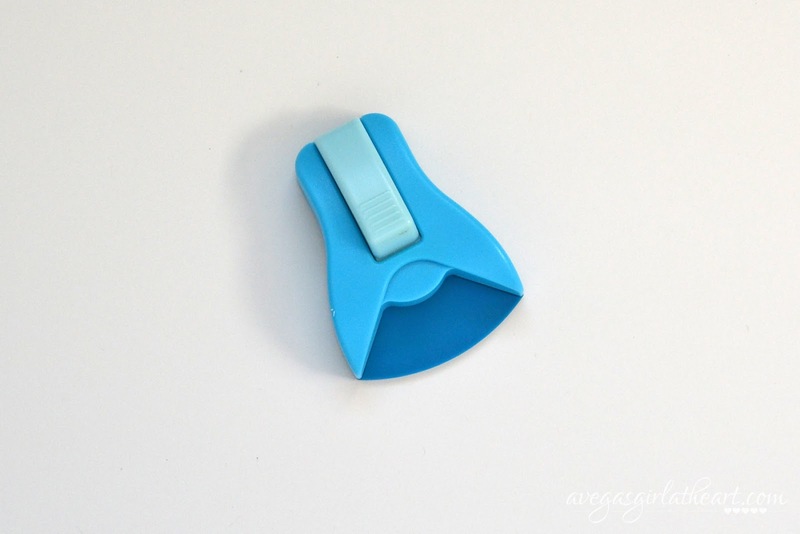 While I generally love this style of punches (Stampin' Up!/EK Success), this one, like the Becky Higgins one above, isn't my favorite, for the exact same reason. I get wonky corners even more often with this punch, and I believe it is because it is just too small. There isn't enough of a "wall" on the edges of the punch. 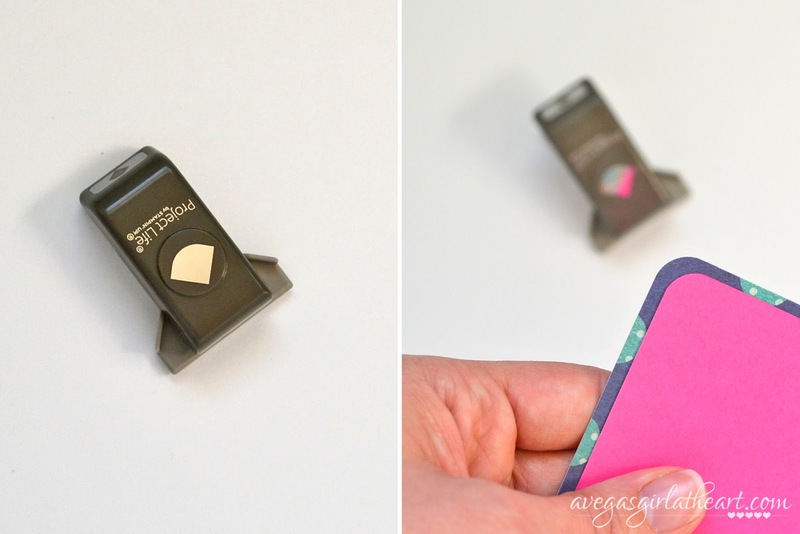 But once again, it is inexpensive and perfectly matches, so if you are a regular Stampin' Up! customer or demonstrator, this might be the way to go. This punch doesn't require emptying a chamber like the Becky Higgins one - the pieces just fall out the bottom. My favorite punch for Project Life remains my Marvy Uchida blue corner rounder. I have had this punch for years, and used it on probably over a thousand photos or cards, and it has never dulled. 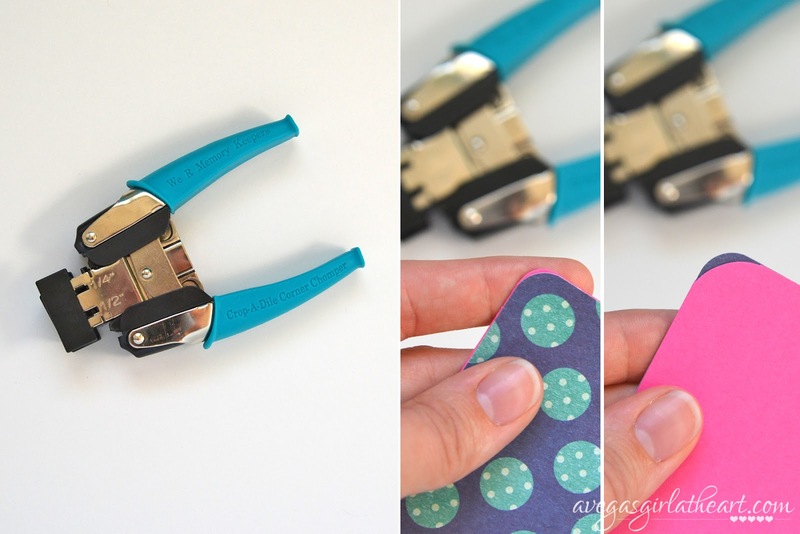 I actually used this punch for Project Life exclusively, only acquiring the official Project Life punch late last year and the Stampin' Up! one very recently. The one thing I would tell you that could be a con for this punch is the lever - if you're punching a lot of photos in one sitting, it can wear out your thumb. I didn't have a problem until one time I was punching a year's worth of title cards out at once. This punch is inexpensive and can be found at the chain stores, so you could use a coupon on it as well. Like the Stampin' Up! punch, there is no chamber to empty. The pieces just fall out. Now for the other punches I showed you above. These do not match the Project Life corners, but they are popular brands of punches and since I have them in my toolbox, I thought I would show you these at the same time. This Creative Memories punch has been around for years. I got mine back in the late 90's if I remember correctly. It's stayed sharp and is still a great punch. Unfortunately Creative Memories is no longer the same company and they don't sell this punch anymore. I have seen them all over eBay though, so keep an eye out. You empty this one by flipping open a little door on the backside of the punch. It's a wider corner and pretty for making cards. This Zutter Round It All punch I picked up when I was making mini albums with my Zutter Bind It All. It is perfect for punching corners in chipboard album covers. It has a little door on the bottom of the punch to empty it, and it is also a wider corner. 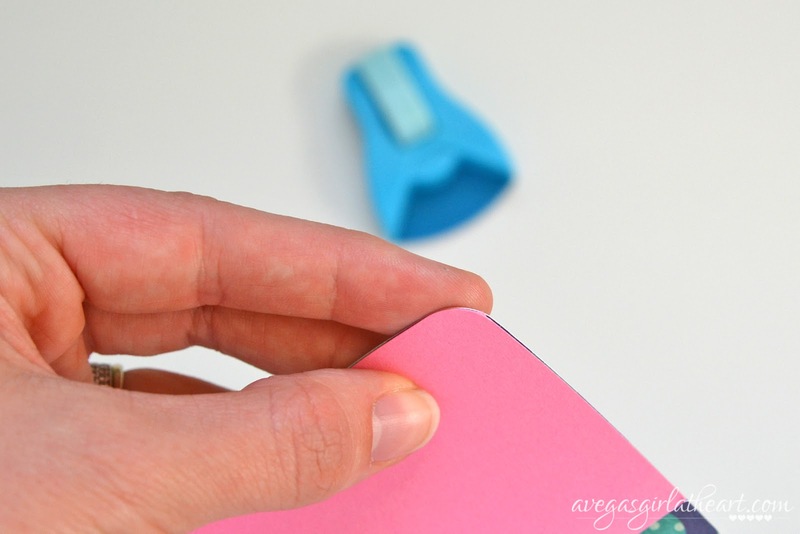 I don't like using this punch for paper, but it works well enough with a good card stock. I really keep this around for chipboard. This punch is pricey though. Finally, I have two We R Memory Keepers Corner Chompers. This teal-handled one is the one you're probably most familiar with. The corners do not match up with the Project Life cards, but the punch works very well, for both card stock and chipboard. This one has two sizes of corners - 1/4" and 1/2". You empty it by flipping open a little door on the front of the punch. Size-wise, it is a beast. And, it's more expensive than the Project Life brand punches. I received one as a gift and use a gift card on the other, because I had a hard time paying $20 on Amazon for a punch. I have seen them at Hobby Lobby but I think it would be about the same price with a coupon as on Amazon. This yellow-handled one, I must say I'm disappointed in. It also has two sizes - 1/8" and 3/8". The 3/8" side punches as well as the teal-handled one, but the reason I wanted this punch was for the smaller corner. 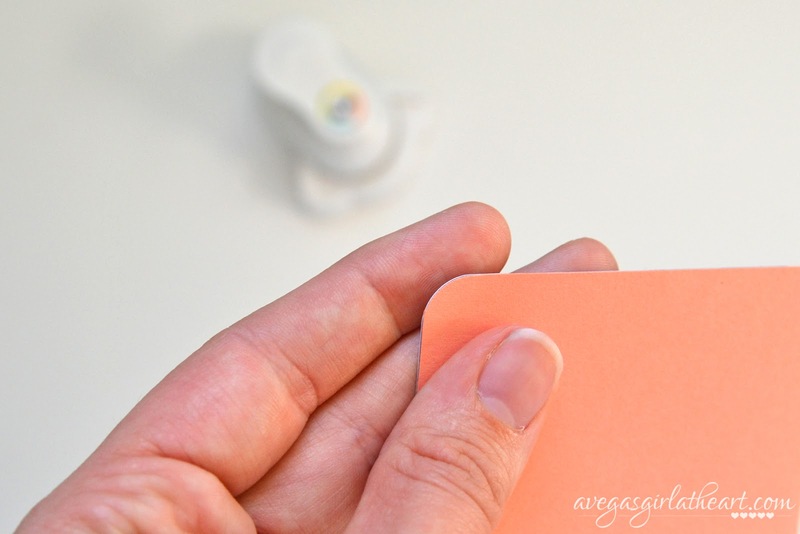 I had seen it in use on You Tube and loved the idea of a subtle corner on a card. Unfortunately I simply cannot get a clean corner. If you can see in the image on the right below, the corner just looks, fittingly, chomped. It's a big jagged and rough and not at all even. Frankly, it looks terrible. I've tried it with paper, card stock, and chipboard, and I get the same result. So I would not recommend buying the yellow-handled WRMK punch. 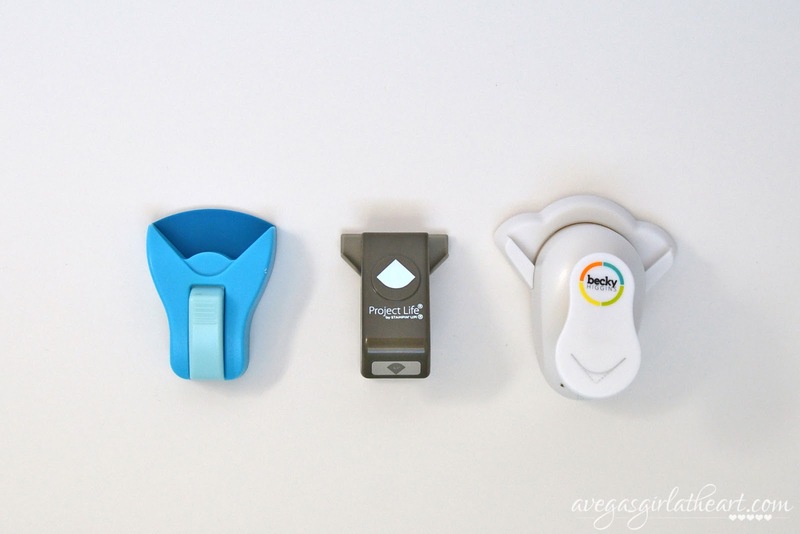 The teal one would be great if you want to punch heavier stuff that the smaller Project Life punches can't do. In summary, my favorite punch for Project Life is my Marvy Uchida. 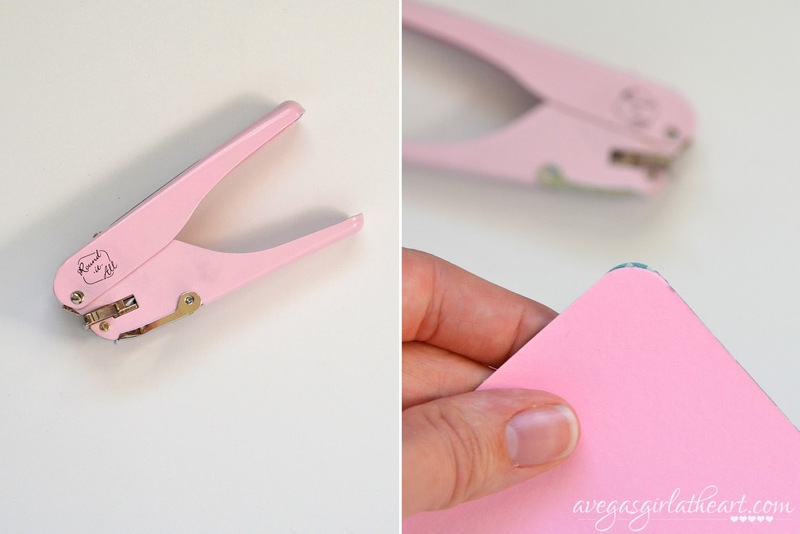 It is inexpensive and matches the Project Life cards perfectly. For chipboard, I would recommend going with the WRMK teal-handled punch over the Zutter Round It All, based on price and that you get two sizes in the WRMK punch. I hope this helps some of you out there trying to decide on which corner rounder to get. If you have any other questions, leave them in the comments and I'll try to help! Your Marvy looks similar to my xacto corner punch. Very similar punch lines and it was only 4 bucks. I also felt like for the money the Chompers were a huge fail. Not smooth and not a close enough match at all. Yes! 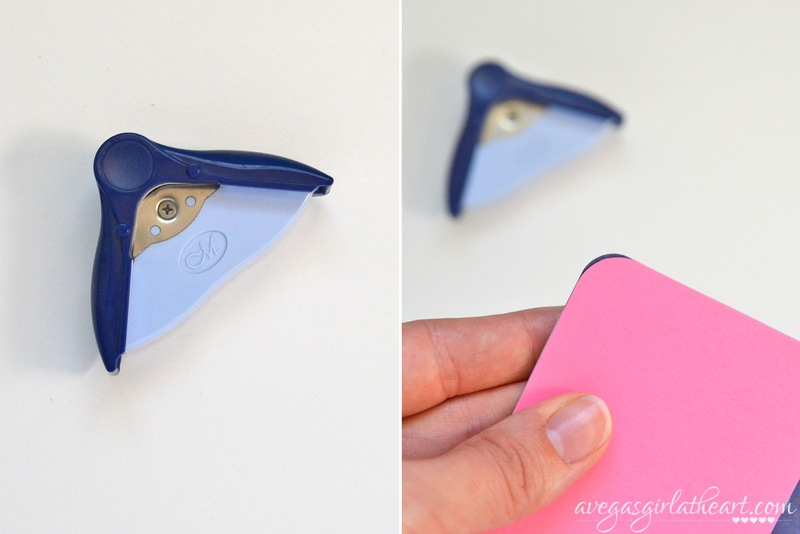 I've seen the X-Acto (I think I actually bought one for Shannon) - very similar in size/shape. I haven't tried it myself though. I have the Project Life branded punch and it does not work well at all. I end up with odd looking corners and the punch tends to stick. It is a great match but it hasn't held up to my weekly spreads. Yeah, I just think the sides aren't quite right to allow a good line up. It's very strange. I have the Project Life brand punch and would get stuck all the time and now, it is permanently stuck. I love the Stampin' Up! Project Life corner rounder. I might have to look for the Marvy one! Mine hasn't gotten stuck, thankfully, but I've had other punches that do. Have you tried the freezer trick? I think you may have just gotten a defective yellow corner chomper from We R. I have heard they are really good about replacing them. 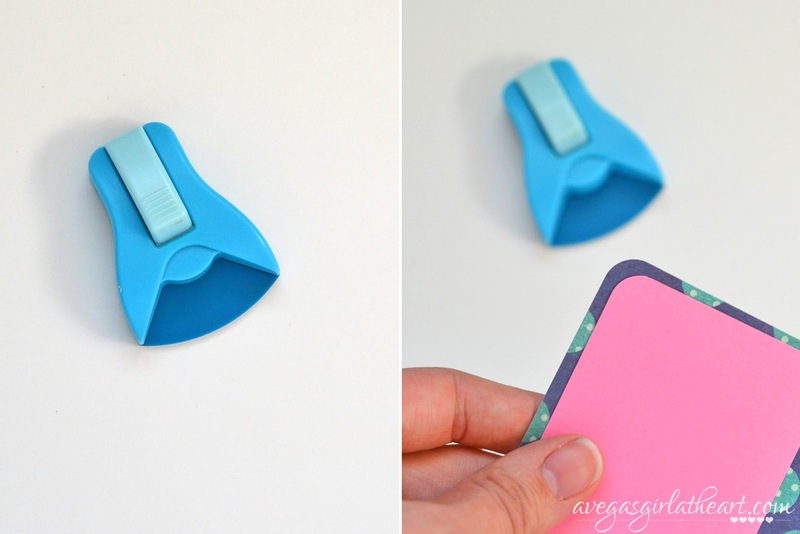 And, they can "chomp" multiple pieces of cardstock at once. 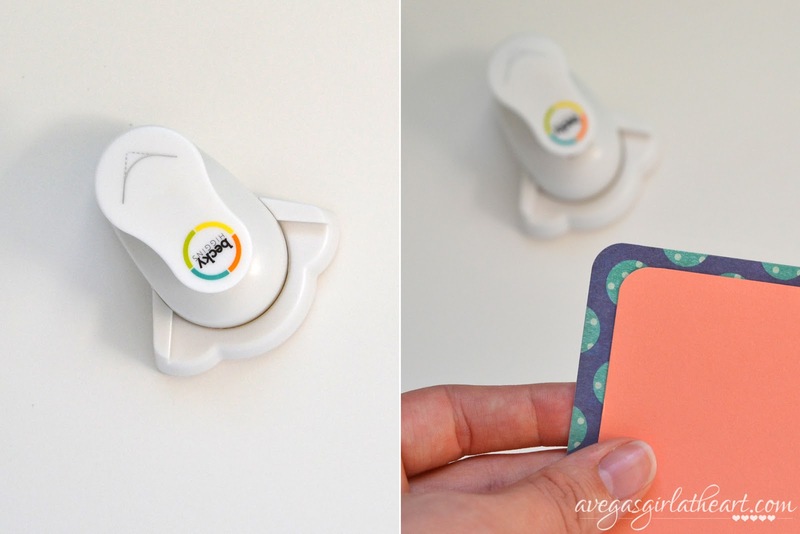 Plus you can use them on chipboard as well. Thank you for this! 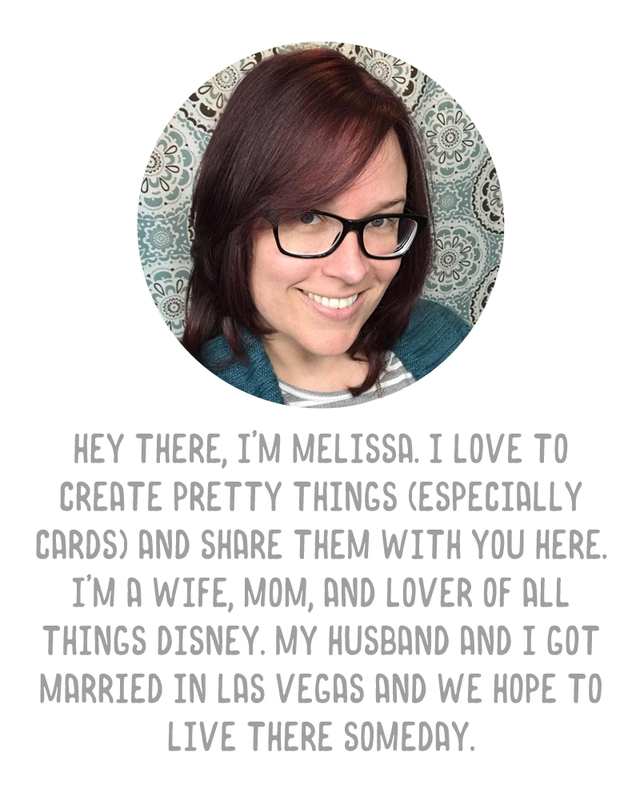 I have a little EK Success punch that I wound up using on ALL my PL stuff, including cards, last year because I couldn't find one to match. This year I decided to cut only my photos instead of everything, to save time, and bought the PL punch. Huge fail sorry to say. Thx for your review of the Marvy punch. It's in my Amazon cart right now! Thank you for sharing this info, I just got started with Project Life and now I know which punch I need to round the corners of my photos. Sorry this question is SO MUCH later than your original post, but I can't find the answer anywhere else. Do you know how the size of a corner punch is measured? Is it the distance between the edges of the paper? Which could otherwise be described as the width of the rounded corner? I think that it is the start of the curve to the end of the curve, measured across? I think so, anyway.